I don’t know about you but I’ve always wished there was a little bit more magic and some of that ever-so-helpful fairy dust in the world. Catherine Ryan Howard obviously thought so, too. Not only did Cath want to live and work in a land filled with unlimited magic and pixie dust, but she also longed to live in the United States and see a Space Shuttle launch. Which is why, in September 2006, she left Ireland clutching a J-1 visa, headed for the magical Kingdom that is Disney World in Orlando, Florida. Shortly after arriving, Cath’s Disney bubble burst and she had to take a dose of that hard-to-stomach tonic known as Real Life. But where a lot of young people in her position might have cut their losses and flown home or gone travelling for a while, Cath decided to stay and pursue her dreams. 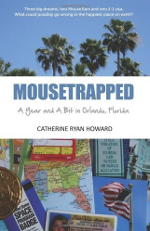 Mousetrapped is Cath’s fascinating and humorous memoir about how she came to live and work under Mouse rule and what it was like in reality. She captures the highs and lows of living and working abroad, especially how the daily routine rarely matches the heady expectations, while also providing a behind-the-scenes look at how a Disney World Resort Hotel really runs. You can’t help but get caught up in her enthusiasm, determination and almost breathless pursuit of living her dream. Her writing style makes the book read like a series of chatty letters from a friend and this works in its favour. It especially makes it that much easier to digest the detailed information Cath includes. I particularly enjoyed the chapters dealing with her visits to the town of Celebration and the Kennedy Space Centre, together with the much-thwarted attempts at seeing a Space Shuttle launch with her own eyes. I thoroughly enjoyed reading this account of Cath’s “year and a bit” in Orlando. I haven’t been there yet but I’m glad I’ve read it in advance of going (whenever that may be). While I’d recommend Mousetrapped without hesitation to anyone considering visiting Orlando, the Disney World theme parks and/or the Kennedy Space Centre, I’d also urge anyone who is thinking about living and working abroad to read it, too. It’s a well-written memoir that tells you what it’s really like to leave your home to set up a new life and start a job in a foreign country. Mousetrapped was published on March 29, 2010 (now forever known as Mousetrapped Monday) and officially launches at Douglas Books in Cork on May 8, 2010. Catherine Ryan Howard is currently editing her first novel and blogging as Catherine, Caffeinated. She also blogs for TheLOSTBlog.com, tracks the International Space Station and other Space-y happenings, and tweets as @CathRyanHoward, all while consuming worrying amounts of caffeine.